I’ve been blogging for more than five years and somehow never got around to writing about Otter Pops. I’m even more shocked than you are. Otter Pops were a staple of my childhood. I always knew that summer was approaching when my mom would come home from Costco with a big box of Otter Pops. My sisters and I would squeal with excitement and quickly throw them in the freezer because Otter Pops are the frozen treat that you have to freeze yourself. 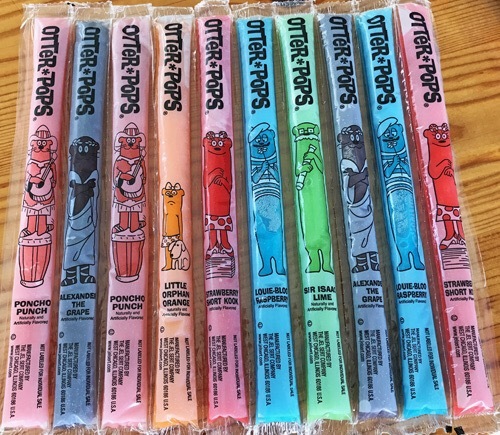 Otter Pops come in six zippy flavors, each one named after a different character. There’s Louie-Bloo Raspberry, which tastes like blue raspberry. There’s Poncho Punch, he tastes like tropical fruit punch. Alexander the Grape is the purple one. He tastes like grapes and might be the worst flavor if there is such a thing. The orange one is Little Orphan Orange and she tastes like orange. She’s the other contender for worst flavor. Strawberry Short Kook is red and tastes like strawberries. Then there is Sir Issac Lime, he’s green and tastes like lime. There used to be a yellow lemon flavored Otter Pop known as Rip Van Lemon, but he must have sucked because he disappeared in the seventies and nobody really cared. I was addicted to Otter Pops. I would steal them and hide the evidence. I would go after Poncho Punch, Louie-Bloo Raspberry and Sir Issac Lime first because they were the best flavors. Then I would eat a Strawberry Short Kook to make my tongue red again. I would stash the wrappers under the top layer of trash. I had my Otter Pop stealing technique down. I probably ate half of each box by myself. I should apologize to my sisters but I regret nothing.